Sloping floors can indicate a serious problem in your Wyoming or Nebraska home. When first noticed, you may simply believe that they are a minor annoyance. However, a sloping floor is a key sign that you are in need of foundation repair because your foundation is sinking or settling. Rapid Foundation Repair can help with all of your sloping floor repair needs in Wyoming and the surrounding areas. These problems often occur in groups because when the foundation of your home is damaged, it can damage many other parts of your home. The most common cause of a sloping floor is a sinking or settling foundation. Home foundations in Wyoming and Nebraska naturally sink over time due to soil compaction and different moisture levels. However, poor construction can mean your foundation slips even more than usual, causing the symptoms you see above. These problems are bad enough on your own, but they are only surface issues. The real problem is an uneven foundation, and that problem must be resolved in order to see results. Sloping floors may require immediate attention depending on the severity of your foundation issues. Contact the professionals at Rapid immediately for more information. We offer multiple solutions for your sloping floors, including resistance or helical piers. Resistance piers are installed beneath your home to help keep your foundation stable. They are helpful in many cases of foundation repair and offer a quick, quiet installation. They can be used immediately following installation to provide more support to your foundation and lift it to its original position. Helical piers, similar to resistance piers, are used to support the foundation. They are screw-like steel rods that are most common in repairs that involve wall cracks or bowing walls. Helical piers can be installed in any weather situation and immediately begin lifting your home’s foundation to its original place. Don’t let the sloping walls in your home sit. 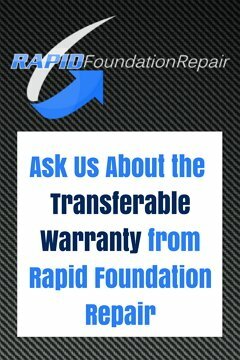 Contact Rapid Foundation Repair immediately to learn about your options, and allow us to take care of your home’s foundation.